The police described Mary Ashliman as “a dance club hostess”. She herself preferred “manageress and hostess”. The term “Hostess” had then and retained through the forties and fifties rather ambiguous connotations. Ruth Ellis, the most notorious “hostess” of the post war period, insisted on being called the manageress of The Little Club. Miss Ashliman lived at No.6 Regents Park Road, two doors up from from Cecil Sharp House – home of the English Folkdance and Song society, which had opened its doors in 1930. She is listed in the 1932 London phone directory but other than that seems to have left no trace on recorded history. Her police statement tells us that the club secretaries of The Blue Angel (52 Dean Street) were John Bell of 75 Anlaby Road, Hull and Frederick John Hicks of 37a Dennington Park Road, West Hampstead. The only Frederick Hicks in the phone books of the era is, tantalisingly, a dispensing chemist. “I know Mrs.Barney. She is not a member of the club but has been there three or four times.The first time was on the 10th of May, when she was signed in by a Mr.Hugh Wade, 64a King’s Road, Chelsea.The second time, on the 24th of May, When she was signed in by Mrs. Heather Pilkington of St.Mary’s Cottage, Farnham Common, Bucks., and the third occasion was last night, the 30th of May, when she came in with Mr.Stephens and Mr. Arthur Jeffress, who is a member and signed both Mrs. Barney and Mr.Stephens in.On one occasion Mr.Stephens came to the club with Mr. T. Skeffington Smith, 19 Orchard Street, who is a member. The interesting name here is Heather Pilkington. 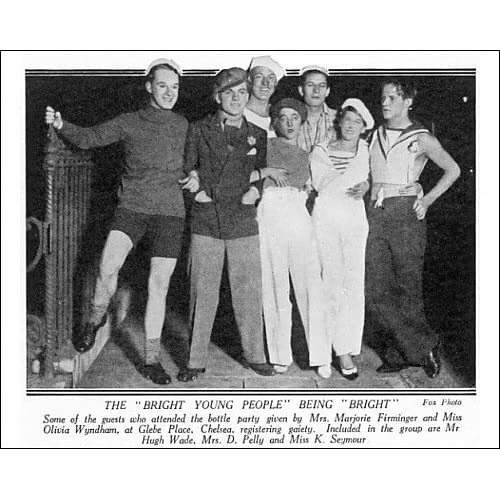 She was the original of the character “Bracken Dilitor” in Marjorie Firminger’s ill-fated roman a clef “Jam Today” (Obelisk Press 1931).Firminger, a minor actress – like so many of the young women in this circle – had co-hosted a number of parties with Olivia Wyndham. More unwisely, she had become infatuated with Wyndham Lewis. Lewis was possibly a genius but also one of the most unpleasant figures of the English modernist movement. He had asked Firminger to introduce him to some genuine Lesbians (or Sapphists,as he termed them). Firminger obliged and chose Heather Pilkington. She also tried to impress Lewis with a “warts and all” novel using thinly disguised real people. 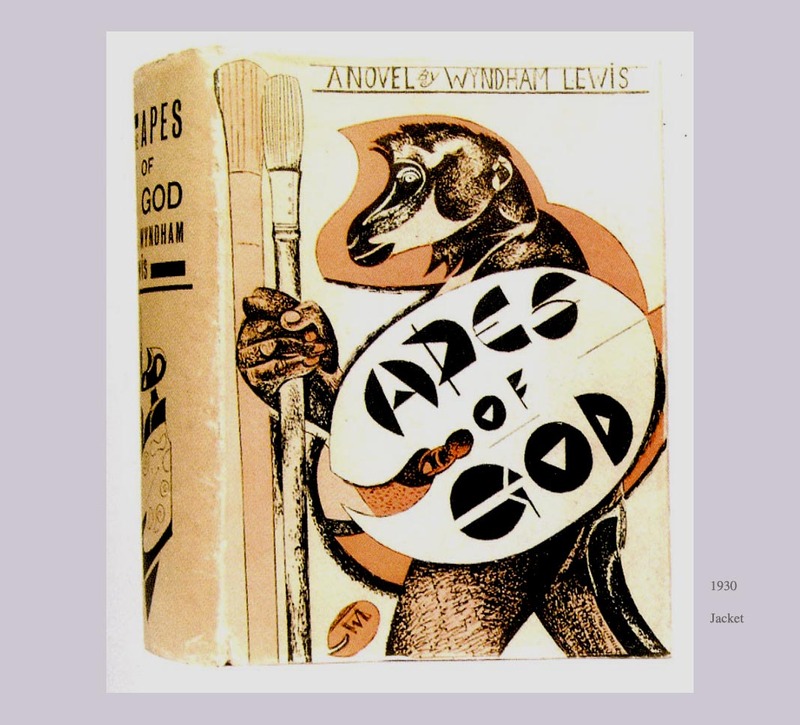 Lewis had,of course, just done the same thing in the magnificent (but largely unreadable) “Apes of God”. That wife was Wyn Henderson, friend and collaborator of Nancy Cunard, and subject to an equally blunt portrayal in “Jam Today” – which novel, it is fair to say, ruined Firminger’s social life, lost her a lot of friends and was no success artistically. Nor did it impress the odious Lewis. Wyn was the mother of Nigel Henderson whose surrealist-inspired photographs of the East End owe much to the pre-war artists her mother introduced him to. Going back to the Barney affair, once again, we find that Elvira is closer to the artistic and lesbian Bohemia of the era than is usually imagined. The “mannish” woman who leaves the cocktail party with Michael to replenish whisky stocks was thought by neighbours to be Joe Carstairs. I think it was Ruth Baldwin but it is just possible that it was Heather Pilkington. More on “Jam Today” in Neil Pearson’s book on the Obelisk Press, “Obelisk”, which cannot be recommended too highly. There’s a couple of letters in the Tate archive which suggest that Barbara Ker-Seymer got pally with Mrs Pilkington (who was married to a Pilkington of Pilkington Glass) which was one intro to the Olivia Wyndham world. But she’d also been friends with Brian Howard since childhood, of course. Well my dear all is known in the cafés of the Boulevard Montparnasse of your charming little stay with Mrs Pilkington news travels like wildfire in the gay haunts of painted sin. Did you ever see such a lady as Lucy [Norton]? Such a shingle or I may say bingle & a nice permanent. How did she get to know Olivia says Lucy. they seem very friendly…[cf Well Dearie, p. 52] she has got into such a lesbian set hasnt she that Mrs Pilkington is such a dreadful woman or do you like her? Well you know dear I ses I never can resist a raddled baby face and a little child shall lead them is all I can say. Thank you for that -very interesting and most helpful. I’ve got your wonderful book on Burra (I’m assuming it is you, forgive me if not) but Burra’s letters are still on my “To Buy” list. Isn’t “the gay haunts of painted sin” just perfect? I’m going to do a post on Olivia in Harlem and Burra will reappear there.Ker-Seymer deserves to be better known too.As I have a particular interest in jazz and black American music, I’m also trying to work out what was actually played at these parties – the term “jazz” gets used too readily for all dance music in the era but folk like Burra and Jeffress were real connoisseurs and it might be the case that this “set” played a greater part in popularising “the real thing” than music historians have generally realised.I must chase up Lucy Norton as well. Anyway, I’m extremely grateful for your information as it provides just the sort of direct link between these characters that I’m struggling to establish. You might look at an article on Ed’s record collection by Paul Farley, ‘Into the Groove’, Tate Etc. 2 (2004), http://213.121.208.204/tateetc/issue2/behindthecurtain.htm. Did you know there’s a Barbara Ker-Seymer collection in the Tate archives? Including pocket diaries, which shed a blaze of light on her social life. BTW, on the subject of Bar and musicians, she was VERY friendly with Jimmie Daniels, and in the 50s, with Mary Lou Williams. Excellent. Just the sort of thing I’ve been hoping to find. Somewhere there’s a reference to Burra being an early customer of Levy’s of Whitechapel. They were the first to import American jazz and to release some of it on their own labels. I knew that Jimmie Daniels was friendly with quite a few of the Chelsea crowd – Olivia Wyndham etc. There’s a mention of him in Freddie Ashton’s biography.There’s a significant overlap between the gay Harlem scene and English Bohemia – Daniels was also a lover of Kenneth MacPherson – which brings Bryher and HD into the mix – Mary Lou Williams is a great favourite of mine, I think I’ve got a biography somewhere about the place. There are some very funny photographs of Macpherson and Daniels, taken by Barbara Ker-Seymer, which someone has put on Google (they’re from the albums now in the Tate), you’ll find them if you Google-image BKS. Another acquaintance of the 20s was Norah Holt, who was over singing in ‘Blackbirds’. Bryher was among those who went over to America to see Four Saints in Three Acts, which Ashton choreographed (by the way, if you haven’t read Julie Kavanagh’s Ashton biog, add it to your list). Probably the most culturally “foreign” thing I have read on this blog so far is the fact that Elvira and friends went to a nightclub and ate kippers! This seems so bizarre. Was it due to licensing laws (ie they had to have food if they were going to drink)? But if this is the case, why didn’t they have sandwiches or a sausage roll? Kippers smell. And if they didn’t need to eat for licensing purposes, were they hungry just a couple of hours after eating sweetbreads and quail? Very odd. I expect the kippers were to do with the licensing laws -I know bacon and eggs were a standard club item – Kate Meyrick served breakfast at her clubs from “10pm”. Or perhaps it was just the BYP equivalent of a kebab. The consumption of ‘Kippers and Chianti’ is a shorthand for ‘bohemians’ in Margery Allingham’s Look to the Lady, and I half-remember feature also in Lord Peter Wimsey’s occasional descents into Chelsea. I think that the fiction that clubs existed ‘for the convenience of those who required early breakfast’ required breakfast to be available. Speaking as a cook, bacon and eggs, indeed, anything involvig eggs, is relatively difficult: a night club would presumably NOT have much of a kitchen staff (or indeed, of a kitchen), and edible fried eggs take a quite a bit of skill. I speak as someone who has not infrequently had six house-guests at a time, and who has put in a good many hours standing by the stove with scrambled eggs, bacon, porridge and so forth on standby in a state of arrested development, waiting for people to get up. Breakfast on demand, in other words, is bloody hard work. But kippers, semiotically recognisable as a breakfast item, can be ‘jugged’, i.e. put the fish in a jug, tail end up, pour boiling water over it, and leave it for five minutes, then take it out. Thus is achieved a cooked kipper, without requiring more than the most primitive kitchen facitilies, or staff. It was a rigid era: sardines would count as a ‘savoury’, therefore after dinner food: kipper and finnan haddock (similar, but haddock not herring) were breakfast items, and were EASY. I’m just starting on the Allingham novels – a nice lightness of touch,quite a joy in comparison to Christie or Sayers, both of whom I like but find heavy going.Wikipedia says that she started a “serious” BYP novel but gave it up – shame. On an unrelated topic, have you come across a photographer called Dudley Glanfield? I think there might be some connections, for my purposes, there.”Kippers and Chianti” is such a delightful phrase -I’d like to think that there was an unpublished manuscript bearing that title languishing in the library of some Cotswold country house. This actually relates to Maurice’s reply below – there isn’t a reply button. I take your point about the BYP’s lack of consideration. Hostesses like Mrs Meyrick or Rosa Lewis could obviously provide a full British breakfast as and when required, but perhaps not all proprietors could? And I think Agatha rather makes my case: BECAUSE a raid is expected, only kippers are offered, suggesting that they are the absolute rock bottom minimum. Now I suppose it would be toast and marmalade, but those were the days before toasters, remember. This just gets better and better.It appears that Edwina Mountbatten and her lover Laddie Sandford, after leaving the Kit Kat club, ate kippers at the very chic Uncle’s on Albemarle Strret. On one occasion,The Prince of Wales surprised the waiter at the top people’s club the Embassy by asking for kippers and brown bread. Film producer/director Herbert Wilcox and his table then proceeded to do the same, so the Prince may have set a trend here as his every move was copied by certain socialites. However, these clubs, the Embassy particularly, would have had extensive catering facilities, the Blue Lantern would have had next to none – so your initial explanation sounds right to me. What a fascinating thread… I was just looking over Eric Whelpton’s The Making of an Englishman, and he mentioned the Hambone as serving “meals” of bacon and eggs, and kippers. Jane Stevenson, your explanation makes complete sense although I agree with Agatha Runcible that kippers (especially accompanied by double whiskies) are “not very drunk-making”! Sue, I’ve just got the Whelpton book – I was hoping for more on Nerina and EM but it’s interesting nonetheless – If the Clover Club is the same place I’m thinking 0f then it was certainly a “dive” – the Hungarian beauty Whelpton worshipped from afar is the same woman who nearly had her arm severed thanks to Elvira’s driving on the road to Cannes.